I began my career in the U.S. Navy where I served my first tour as Electrical Officer, and on my second tour as Assistant First Lieutenant. Our main responsibilities were to maintain the outboard skin of the ship, which means lots of painting, sea and anchor equipment and replenishment of at sea equipment. In 2008 I became a Mechanical Commissioning Engineer with Alstom® Power. Initially, my focus was on the GT 24 and 26 fleet and then I was invited to work in Germany on a permanent basis as a commissioning engineer where I worked on all 50 Hz GT unit types in Germany and the Netherlands. I was also part of the base fleet engineering department where I planned both minor and major outages for GT11N/N1 and N2 units. As Alstom integrated with GE®, I was also trained as an assessment engineer for the GT 24 fleet and as a Field Engineer where executed both minor and major outages on both base and advanced fleet units. 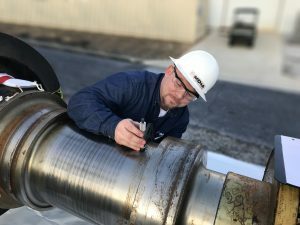 I left GE® and started with MD&A in September 2017 as a Field Engineer. I am a Project Manager on various planned and forced outages where we perform maintenance and repairs to gas turbines and associated equipment. What has been your favorite project at MD&A? My favorite project was a dual gas turbine major inspection that ran in parallel with one another. Before the end of the dual major outage, the customer requested that we also remove the compressor of a third unit. As a result, MD&A contracted a third crew of experienced millwrights to accomplish this task. This third crew fell under my responsibility to support and lead to assure their success in the task at hand. This allowed me to utilize my resource management skills that I gained during my tenure as a US Naval Officer. What was the most interesting challenge you have had to resolve in the field on an Alstom® Gas Turbine Outage? The most interesting challenge that I faced while working an Alstom® outage began with a steam turbine assessment (open condition) on an Alstom® 160 MW HP/IP/LP Single shaft arrangement steam turbine during a major overhaul of a unit. It was the second of a 3-unit single shaft combined cycle power plant. After submitting my report for the steam assessment, I was requested to perform commissioning of 240 MW dual combustor gas turbine. Commissioning is composed of two phases: cold and hot commissioning. Cold commissioning entails ensuring that all fuel valves, VIGV angle, and blow valve angles are properly adjusted. Hot commissioning entails ensuring that certain live tests are successful, such as, flame off tests and live overspeed trip. These tests are performed to make certain that the unit is safe to go on the grid. Then the performance of the unit is adjusted in order to ensure that the power output, emissions, and pulsations are met according to the customer. The GT 26 can be adjusted as low as 15 ppm NOx and 0 ppm CO.
After completing that assignment, I was asked to perform gas turbine borescope assessment (closed condition). Originally, I was requested to mobilize for 2 weeks to do the steam turbine assessment, but in the end, I was onsite for more than a month and a half and I was able to utilize 2 out 3 of my Alstom specialties: GT commissioning and ST/GT assessment. I get the greatest job satisfaction from the successful completion of a project: when my efforts come together, the unit is making power, and the customer is happy with the product that MD&A has provided. Tie between time travel and super-human speed!